Down 2 Dakar: Chris & Andrew take on the Plymouth-Dakar Rally » Blog Archive » Camels! We’re in northern Morocco now. 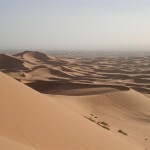 We have been down through the high atlas mountains and to the Sahara, near the Algerian border. The photo’s don’t really do the scenery justice, but then most people say that don’t they? 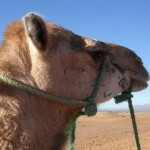 We forgot to mention in our blog yesterday, but some chaps offered us four camels for the pug. We considered this offer, and even spoke to Brittany Ferries to see if we could transfer our ferry booking to a camel but they wouldn’t do it so we turned it down. Four camels seemed like a fair price, but on reflection, we think we chose correctly. The running costs of the pug are probably less….